Mitochondrial Eve is the name given to the matrilineal most recent common ancestor (MRCA) of modern humans. In other words, she was the woman from whom all living humans today descend, on their mother’s side, and through the mothers of those mothers and so on, back until all lines converge on one person. Mitochondrial Eve is estimated to have lived around 192,400 years ago ago in southern Africa (which makes her approximately my great*9,650th grandmother). As well as the DNA that makes up the chromosomes in the nuclei of our cells, we also have another type of DNA called mitochondrial DNA (mtDNA). The mitochondria are organs located outside the cell nucleus which convert sugars into energy. Mitochondria have a small circular loop of DNA, containing only 16,600 base pairs in humans. The circular mtDNA is similar to the DNA of bacteria, and it is thought that mitochondia evolved from symbiotic bacteria that were once free living. We all inherit our mtDNAs from our mothers, but not from our fathers. My mother inherited it from her mother, who inherited it from hers, and so on back through time. Therefore, mtDNA traces an unbroken maternal line back through time for generation upon generation far further back than any written record. Over a period of nearly 200,000 years, a number of random mutations (SNPs) have steadily accumulated on different human mtDNA molecules being passed down from mothers to their children. So mutations provide a cumulative dossier of our own maternal prehistory. We can use these mutations to reconstruct a genetic tree of mtDNA, because each new mtDNA mutation in a prospective mother’s ovum will be transferred in perpetuity to all her descendants down the female line. Each new female line is thus defined by the old mutations as well as the new ones. As a result, by knowing all the different combinations of mutations in living females around the world, we can reconstruct a family tree right back to our first mother. 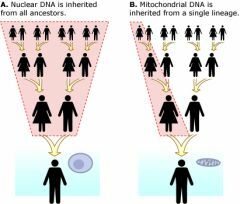 All of our maternal lines are connected at some time in the past and these connections can be traced back for over 100,000 years by looking at the patterns of mutations in mitochondrial DNA. When a group of people share similar mutations, they are part of the same “haplogroup”. For example, over 95% of native-born Europeans fit into seven haplogroups, which in turn derive from an older haplogroup that arose in the Middle East. Other regions of the world are associated with different haplogroups. Each of these groups trace their maternal ancestry back to just one woman, the common maternal ancestor of everyone in her haplogroup, or clan. Not everyone in the same clan has exactly the same mtDNA, because DNA accumulates additional mutations gradually over the generations. However, everyone in the clan shares a set of common mutations, which are the signature of the mtDNA of their founding maternal ancestor. By averaging the numbers of mutations found in the mtDNA of modern members of a haplogroup, and knowing the average mutation rate for mtDNA, it is possible to estimate how old each clan is, or in other words, when the common maternal ancestor of the clan lived. By studying features of the geographical distribution of their present-day descendants, it is possible to work out where they most likely lived as well. Generally speaking, the likely geographic origin for a clan is not necessarily the place where it is most common today, but the place where it is the most varied. 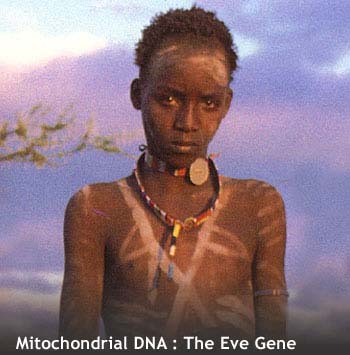 Mitochondrial Eve is the name given to the matrilineal most recent common ancestor (MRCA) of modern humans. In other words, she was the woman from whom all living humans today descend, on their mother’s side, and through the mothers of those mothers and so on, back until all lines converge on one person. Because all mtDNA is generally passed from mother to offspring without recombination, all mtDNA in every living person is directly descended from hers by definition. Mitochondrial Eve lived around 192,400 years ago. She is the female counterpart of Y-chromosomal Adam, the patrilineal most recent common ancestor, although they lived thousands of years apart. Mitochondrial Eve was not the first woman, nor was she the only woman alive at the time. Her contemporaries could still have descendants, whose line zig-zagged back and forth between males and females, but Eve was the only one who had an unbroken line of daughters, through thousands of generations, right down to the present time. Mitochondrial Eve is estimated to have lived around 192,400 years ago ago in southern Africa (which makes her approximately my great*9,650th grandmother). This was during the time when Homo sapiens sapiens (anatomically modern humans) were developing as a population distinct from other human sub-species in Africa. She lived later than Homo heidelbergensis from whom Homo sapiens split around 250,000 years ago but earlier than the period when modern humans left Africa. She lived much later than the earlier “Eve” ancestral to both modern humans and Neanderthals, who split from Homo heidelbergensis around 550,000 years ago, probably in Europe. ** to convert dates to generations, I have assumed the average female generation length was 26.5 years for the last 500 years, 25.0 years for the previous 6,500 years, and 20.0 years before that. This entry was posted in Deep ancestry and tagged ancestry, evolution, Genealogy, genetics, maternal ancestors by colinmathers. Bookmark the permalink. Wouldn’t there be a few people without her genetic material if there were other women around at the time? Fascinating stuff. No. Every other woman alive at that point at some point had a female-line descendent who only had sons, or no children. If you don’t restrict the concept of last common ancestor to only the female descent, but include any paths through male or female, the date at which the last common ancestor of everyone alive lived is surprisingly recent. Someone did a massive computer simulation of the entire human race, building in plausible assumptions about fertility, mortality, migration patterns etc and came up with a date in the last 10,000 years, perhaps even as recently as 3000 years ago. Thanks. It makes sense to me now. Do they know who the common male ancestor is even though more recent? That’s so much Colin for going into this. I have been intending to get my mtDNA checked out. Just haven’t got around to it and there’s also finding the money. I’m also very interested in chasing back my father’s male line. The Curtin’s from the city of Cork. I am particularly interested to find out what happened to the rest of his siblings and whether they survived the Irish Famine, emigrated etc. I’ve read a bit about the Irish Famine and it fascinates me how any survived and that how they survived is so valuable to us today. Irene and I read each others blogs regularly and she put me onto your post. It’s been very helpful. Thank you very much. Thanks, glad you found it interesting. I’ve looked at my male line also and may post on it sometime. But i am waiting for prices to drop and get a more detailed y-dna test. I read a very interesting book a couple weeks ago which summarises prehistoric migrations in Europe using dna profiles from prehistoric remains. Will post something on it soon. This is beautiful and uniting! As it pertains to my feelings, I have a sincere love for Eve, because this signifies how we all unite. I was taught to honor my mother and father all the days of my life; in other words, I honor all of my mother’s and father’s. Therefore, I honor of my eve’s by respecting all of our human family. Let’s be honest! It doesn’t matter who or what is in space if we can’t respect each other in our earthly home. Great work! God Bless You!